In this video I am taking a step back and going to the basics. Installing Qooxdoo from github, and starting your first project. 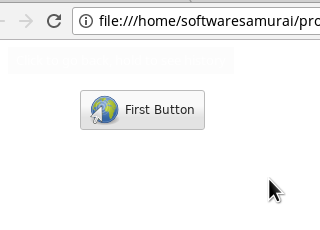 This will generate a simple push button on a web page. Now granted that this is not the coolest web page out there but you have only spent about 5 minutes to create it. Now if you spend some more time on it you can eventually create more complex applications, like a Random Password Generator ( approx 100 lines of code ) or a simple calculator ( approx 200 lines of code ). As a matter of fact you can create quite complex applications which natively support multiple languages, multiple Themes, multiple icon sets etc … . I believe if you have an idea of a complex web based application you will find a solution with Qooxdoo. Please don’t hesitate to leave a comment below if you have questions or suggestions. I had fun creating this short tutorial and I hope it is useful to you. I will move it up and create backend tutorial next. I will work on using a PHP backend first. Using a Qooxdoo backend would require to run NodeJS which is unavail in most shared hosting environments. Thank you so much for your effort! I have a solid background in desktop and client/server development but I’m noob to web technologies. I found the qooxdoo is probably the best framework around for me to try move into web development. Unfortunately I can do this in my spare time only and the learning is very slow. There are literally no video tutorials about the development with qooxdoo on the net except few very old and simple. I purchased a book ‘qooxdoo Beginner’s Guide’ and managed to build the example but there are still many questions. What I’m still don’t understand completely is how to work with back-end data. It will be very helpful to see the building steps and best practices how to work with data and organise the code. Ideally for me (and I’m sure for most learners) could be if you could create a simple full-stack order-entry application with backend written also in qooxdoo (why not?) using JSON server as db server for simplicity.